130 mm B-134 х 1 pcs. 76 mm 34-K2 х 1 pcs. 12.7 mm Colt2 х 2 pcs. 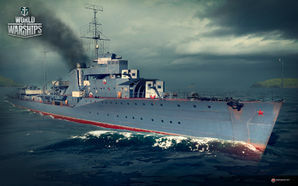 Gremyashchy — Soviet promo premium Tier V destroyer. Gremyashchy was first sold in pre-order bundles from 8 April through 25 June 2015. She has not been sold since. Commonly referred to as the "Gremy" (a shortening of its name), Gremyashchy is interesting when it comes to destroyers. It has fantastic gun range (nearly 12km) with a detection value of 7km, making it ideal for invisible sniping of targets. It also has the advantage of having a 1km buffer between its max torpedo range and concealment so it can launch torpedoes from stealth much like Japanese destroyers. Also similar to Japanese destroyers, Gremyashchy suffers from very slow turret traverse speeds making it less than ideal for close quarter brawls. However, its rate of fire and flat shell arcs are more than enough to enable it to fight off other destroyers with relative ease. Play her like a ranged gunboat, and she will do quite well with her 12 round per minute guns. Great rate of fire and range for destroyer guns. Great penetration with AP rounds for most ships within 7km. Decent torpedo range and concealment. Slow gun traverse (36 seconds for 180°). As a premium ship, Gremyashchy doesn't have any upgrades to research. Gremyashchy plays almost exactly like Gnevny, her tech tree cousin. Commander skills on both ships will have the same focus: maximizing the usefulness of her main battery and improving her survivability. The latter is best accomplished by attempting to preserve her engine functionality (Last Stand) and health pool (Survivability Expert); however, there are other useful skills at those tiers as well, such as Expert Marksman and Advanced Firing Training. Captains will have to use their judgement to decide which is best for their play style. Keeping Gremyashchy’s engine in working order is paramount to her survival; captains are strongly recommended to spend the credits (or doubloons) on Damage Control Party II for the reduced cooldown on repairs. As a premium ship, Gremyashchy comes with Type 9 camouflage that provides her with a buff to her concealment, a debuff to incoming shell accuracy, and increased experience gain. Gremyashchy as depicted on a 1982 postage stamp. Gremyashchy as depicted on a limited edition 100 ruble coin, from the 300th Anniversary of the Russian Navy coin series. This page was last modified on 9 May 2018, at 14:13.